Many powders, especially with viscoelastic compaction mechanism, such as starch or avicel, exhibit large degree of stress relaxation (with time dependent deformation). If you monitor punch displacement and compression force, you can make pretty accurate assessment of the compactability of your material. If LVDTs are attached to both upper and lower punch, it is possible to actually measure in-die thickness of the tablet at various compression levels. 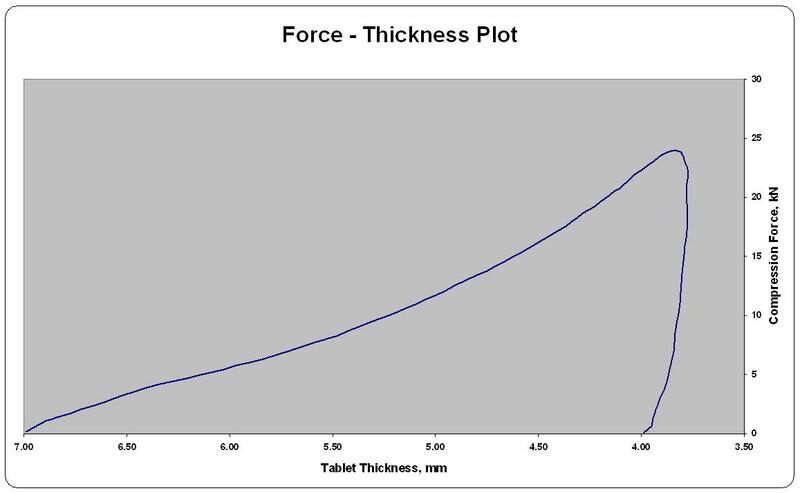 On this plot you can see how the tablet thickness rapidly decreases in the compression stage and then gains some thickness during the decompression stage of the tableting cycle. The degree of this increase in thickness is indicative of the elastic recovery as the pressure is removed from the tablet.